There are many cases requiring you to convert DVD to MP3 format. As we know, MP3 is highly compatible with all digital media players available today, by converting DVD to MP3, you can enjoy your favorite DVD music on any portable media players or in their cars while driving. Here we just test and select 2018 top 3 DVD to MP3 audio converter software for better DVD to MP3 audio ripping. If you have some DVDs need to be converted to MP3, read on the following 3 parts and you’ll be able to quickly convert your favorite DVDs to MP3 without any complicated configurations. Got DVDs and you’d like to convert to MP3 on your laptop? You don’t need to be a computer genius to do it. With Pavtube DVDAid (Review) you’ll be able to easily convert your favorite DVDs to MP3 format in seconds. This all-purpose converter produces the highest MP3 audio quality after conversion. What’s more, this DVD to MP3 converter also has a special and excellent feature. It is fully make use of NVIDIA CUDA technology and AMD ® Accelerated Parallel Processing (APP) to largely accelerate DVD encoding speed from one format to another on Windows. When your computer is geared with a CUDA-enabled GPU, you can get 30x times DVD ripping speed, which can save you plenty of time. It also arrives with a Mac version empowering Mac users to rip DVD to MP3 with ease. Step 1. Insert the DVD you want to extract, and launch Pavtube DVDAid. Click “File” ＞ “Load from disc” to load the source DVD disc. Step 2. Click the format bar to follow “Common Audio” >" MP3- MPEG Layer-3 Audio(*.mp3)". You can convert any favorite DVD video clip to MP3 music by dragging sliders to set start time and end time. If you want to change the original audio effect, you can set the audio sample rate, audio channel, and so on. Step 3. Click "Browse" to set output folder. Step 4. 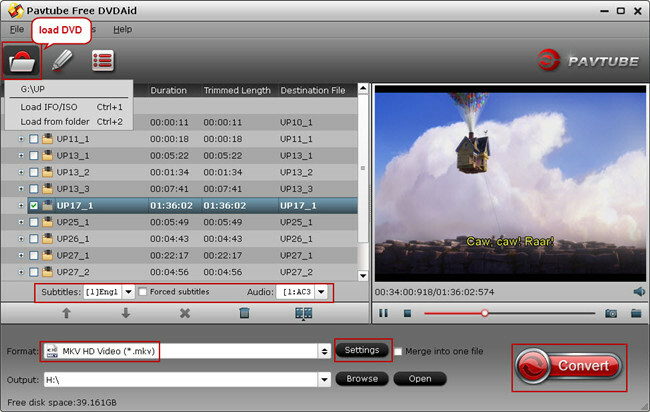 After finishing the above settings, check the files needed to convert in the file list, and click “Convert” button on the main interface to start converting DVD to MP3. 1. Insert unprotected DVD to your computer’s drive. Run VLC. 5. 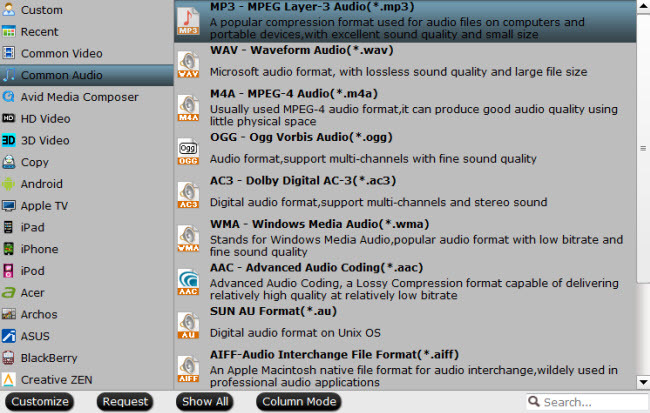 Select “MP3” as output audio format. 6. Click “Start” button to start convert DVD to MP3 with the DVD to MP3 free converter software. Pavtube Free DVDAid has good UI design, giving an easy way to extract MP3 audio from DVD for playback on MP3 player, iPhone, iPad, Adroid, etc. It also allows to choose audio tracks and adjust audio settings. It also can rip DVD to M4V, WAV, OGG, WMA, MKA, AC3, FLAC audio and convert DVD to FLV, WebM, MKV, AVI, MOV, TS, etc video with fast speed and excellent picture and sound quality. And unlike some other freeware which may hide extras, this Pavtube free DVD to MP3 converter is testfied as a 100% clean and safe program without any virus, spyware, adware, etc. It also arrives with a Mac version empowering Mac users to rip DVD to MP3 for free. Step 1. Load DVD by clicking “File” > “Load from disc”. Or load DVD Folder by clicking “File” > “Load from folder” or load DVD IFO/ISO image by clicking “File” > “Load IFO/ISO”. Step 2. 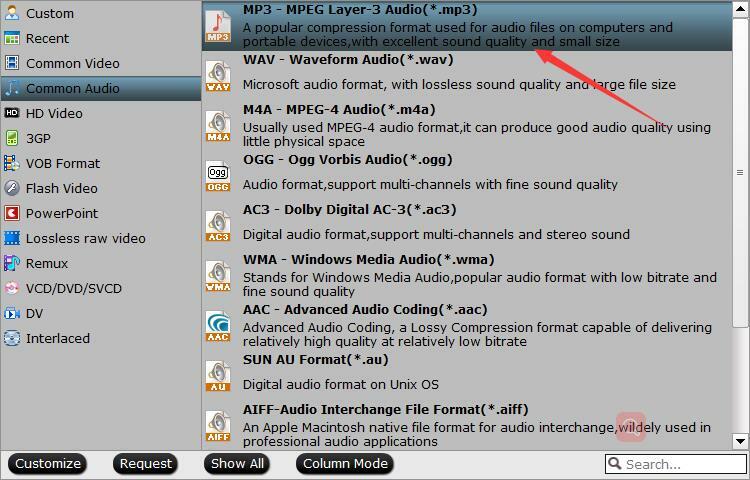 Clicking the Format bar, from its drop-down list, choose “MP3 – MPEG Layer-3 Audio(*.mp3)” as output audio format under “Common Audio” main category. Step 3. Click the “Browse” button to choose the path where you want to save the output MP3 files in. Step 4. When the settings are done, press the “Convert” button to start DVD audio to MP3 free conversion. No matter which DVD to MP3 converter you will take, you can finally rip DVDs to MP3. Just enjoy!